Toward the end of 2016, Apple removed all their USB ports from the MacBook Pro line, in favor of only USB-C type ports. As laptops get thinner, there is less room for ports like USB. Because USB-C is so much thinner than the 7.5mm tall USB port, manufacturers can keep making their laptops thinner, and still have room for an I/O port. That isn’t the only reason for USB-C. USB-C wins over traditional USB in a bunch of ways. Ask any computer technician with a lot of experience, and they’ll tell you how revolutionary USB was when it first came out. Much like that, USB-C is going to revolutionize the I/O world. It won’t be long before USB-C does to USB 3.0 what USB 1.0 did to serial ports. You’re going to start seeing a lot more USB-C ports on computers in the future. Of course, there’s more to USB-C than that, and here are the facts you need, before it goes mainstream. USB-C is going to become the new industry-standard, and not just for power. The USB Implementers Forum developed and certified USB-C the same as it has every USB standard. The USB Implementers Forum is a group of over 700 companies, which include Samsung, Dell, Microsoft, Apple, HP, and Intel. This is important, because it’s a big reason that USB-C is growing the way it is. If you look at the Apple-built and promoted connectors like Lightning and MagSafe, you can see a huge difference. No one uses these connectors besides Apple, and thanks to USB-C, they'll be obsolete soon. If you only glance quickly, it’s easy to mistake USB-C for Micro USB. However, it’s a bit more oval-shaped, and a little thicker. The reason for the new shape is to fit in its best feature. USB-C connectors plug in either way, much like Lightning and MagSafe connectors. You won’t try to plug it in wrong, flip it over, and then flip it back over to get it plugged in. Another interesting feature is the USB-C cables are the same on both ends. Now we’re getting a bit technical. USB-C uses USB 3.1 as its default protocol. Theoretically, USB 3.1 can move data at 10Gbps, which is twice as fast as 3.0. There is a bit of a complication in that USB 3.1 can exist in the original, larger shape. The USB 3.1 ports that are in the original shape are called Type-A. However, aside from desktops, you’re usually going to see USB-C connectors. USB 3.1 Gen 1 standards have been defined by the USB Implementers Forum (USB-IF) as having the same interface and data signaling rates as USB 3.0. So, USB 3.1 Gen 1 works at the same 5Gbps speeds you see in USB 3.0. USB 3.1 Gen 2 has data signaling rates at 10Gbps, which is double USB 3.0, and matches single-channel Thunderbolt connectors. USB-C sends video signals and power streams at the same time, which means you can use the one cable for native DisplayPort, MHL, and HDMI devices. You can connect to most anything if you have the right adapters. In 2016, the USB-IF announced they’re updating the USB-C specs to include audio, which means you might say goodbye to the 3.5mm jack on your computers as well. Make sure, however, to check the specs on any computers you’re looking at buying, because there are differences between USB-C ports. 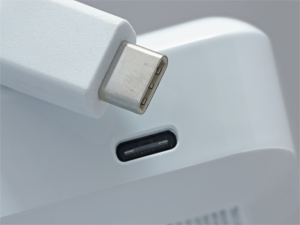 While the USB-C Standard supports connecting DisplayPort and HDMI displays with adapters, some PCs haven’t connected the ports to their graphics hardware. One of the most useful protocols for USB-C is Thunderbolt 3. With Thunderbolt 3, you can see 40Gbps bandwidth, reduced power consumption, and increased power transfer. Thunderbolt 3 powered USB-C ports could mean you just need one cable type for everything. Even power users are going to have trouble finding hardware that can fully utilize USB-C right now. However, that’s not going to last. Even though we’ve only scratched the surface of USB-C’s potential, it’s clear that the next generation of connectors is here, and it won’t be long until USB-C is the complete standard. If you’re considering upgrading a computer or building a computer, or even if you just want to maintain the one you have now, Tech Studio Mac and PC Repair can help. Call (310) 392-3858 or visit the website to see what they can do for you.